Tatcho Drom are performing as part of WOW 2018 on Saturday 22nd September. Tickets available through the Kings Place website. 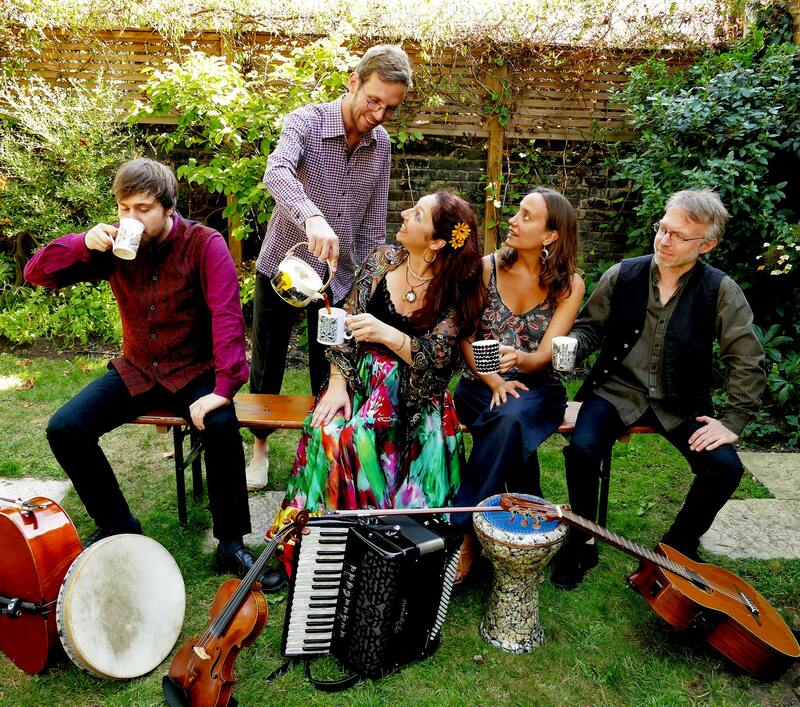 Tatcho Drom stage a vibrant show of beautiful melodies and dancing rhythms from Eastern Europe and the Balkans. Inspired by the charisma of Esma Redžepova, the virtuosity of Taraf de Haïdouks and the humour of Emir Kusturica, they lure listeners into a world of pain and joy, delivering an exciting and memorable performance. The group are considered one of the UK’s leading exponents of Romany Gypsy music. Their repertoire consists largely of music, which violinist and singer Gundula collects on her regular field-work journeys through the Balkans. Tatcho Drom’s performance arrangements are vibrant and delicate, with subtle elements of baroque, jazz and Latin, telling mystery stories of the travels and of the people behind the music. Tatcho Drom means ‘True Journey’, in Rromanes, the language of Romany Gypsies. The principal line-up features a multi-national quintet of dynamic musicians: Violin-vocals, guitar, accordion, cello and percussion. Tatcho Drom perform as a line-up of 2 to 5 musicians. On occasion they work with selected guest musicians and dancers. Gundula Gruen is a virtuoso violinist and singer who has travelled extensively, transcribing melodies that she learned first-hand from Romany and folk musicians.Described by Songlines Magazine as ‘a shining star in the UK’s Balkan music scene’, her unique performance style showcases a technical ability acquired through intensive conservatoire training as well as a colourful and charismatic personality. Her compositions, whilst drawing influence from her love and extensive knowledge of Romany Gypsy music, are original and highly personal. Tommie Black-Roff (accordion – vocals), an accordionist, pianist, singer and composer, grew up in Cornwall, where he was instructed by composer and pianist Chris Fitkin while also being exposed to the local folk tradition. Moving to London he studied Balkan music with Serbian virtuoso accordionist Zivorad Nikolic. Jeremy Halliwell (guitar) is a founder member of Tatcho Drom. He first learned acoustic guitar at age 12 and went on to study classical guitar and renaissance lute, whilst also playing Jacques Brel songs in a band with his older brother. He was a member of a classical guitar orchestra led by Tom Kerstens. Jeremy was inspired to explore Eastern European and Romani music by artists such as Taraf de Haidouks and Trio Bulgarka. He has attended masterclasses and courses with Gypsy guitarists Benjamin Czureja and Olivier Kikteff. Elizabeth Nott is a percussionist of mainly Middle Eastern and Eastern European music genres. For the last 10 years she has worked with various artists and productions including Khyam Allami, Amira Kheir, Magic Tombolinos, London Gypsy Orchestra, Olcay Bayir, Maya Yusef, Karama, Opaz, Marat/Sade at RSC, Golden Journey at Linbury Theatre, “Mi Patria son mis Zapatos” by dancer and choreographer Florencia Guerberoff and many more. Elizabeth’s musical background is very mixed. Born in Venezuela, she learned to play the cuatro (venezuelan type of guitar) as a child, and later the recorder, classical piano and the classical guitar. Fraser Parry (cello) began receiving cello lessons from his father at the age of 8. He played with numerous bands, orchestras and ensembles throughout his teenage years in Glasgow, before studying music at the University of Sheffield, specialising in composition. He was first introduced to European Gypsy music after accidentally crowd-surfing his way to the front of a Goran Bregović performance at the Sziget Festival in Budapest.